Essential oils with unforeseen effect on us humans, high-proof spirits, distilled with a lot of passion and great knowledge with the backdrop of the majestic Dachstein mountain and a whiskey, whose taste can mature for years in the eternal ice. Welcome to the Mandlberggut in the mountains above Radstadt. This is my goal for today´s hike. There are many routes that lead up to the Mandlberggut of the Warter family. Some visitors prefer the paved road and take a car or motorbike, while others ride their bikes or e-bikes up the mountain. Hikers and walkers can reach the idyllic farm after a short march from Mandling past the beautiful reservoir lake. If you ask me, the most beautiful way to reach the property is the circular path leading from nearby Filzmoos. At any point you will have the imposing Dachstein Mountain in your view. You start your walk directly from the centre of the village – first take the forest road and then the ridgeway Mandling to reach the destination of the tour after about an hour. Even on hot days like today, the dense forest provides adequate shade. It does not take long and you leave your daily life behind you down in the valley and just switch your mood into leisure mode after only a few metres. Cheerfully, I hike through the rustling woods whistling with the blackbirds, and inadvertently scare away a mouse here or a squirrel there. Excuse me, it was not deliberate! We have many beautiful views up into the mountains here in the Salzburger Sportwelt, but the view from here of the Dachstein mountain is unique and always fascinates me. 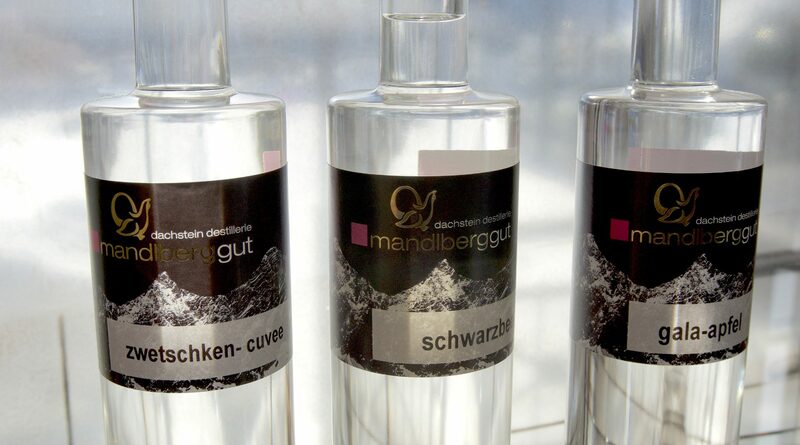 The areas’ highest mountain was also the patron for the name of the in-house distillery at the Mandlberggut. But I will tell you more about this later. As soon as I come closer to the chic and lovingly designed farm, a dog greets me with a wildly wagging tail, acting as today’s welcoming committee. With such a friendly greeting, the visit here can only be pleasant. Meanwhile, the sun has risen to its highest again and from the valley you can hear the church bells announce high noon. My stomach starts to growl, thus letting me know, already slightly annoyed, that breakfast had been completely digested several hours ago. Well then, time to eat! 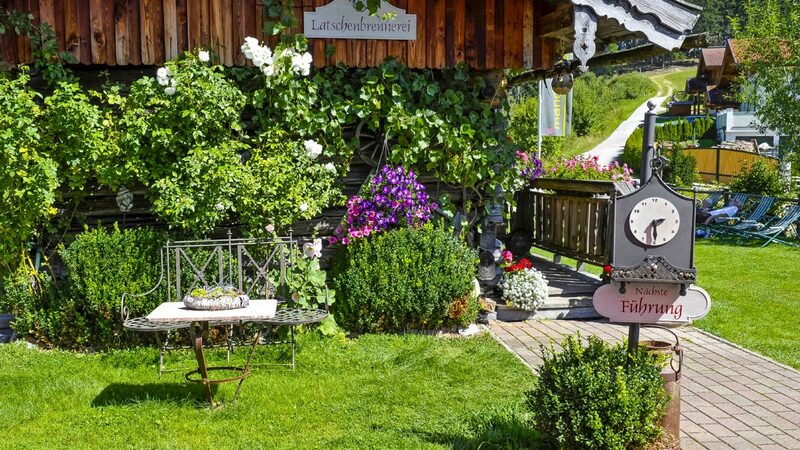 I take my backpack to the comfortable guest-house of the Latschenstüberl, look for a cosy table in the shade, and slump into a chair that looks inviting. As I look at the menu, my mouth starts to water. So many good things to choose from surely make it very hard for me to decide what to have. When I ask the friendly young woman waiting on me what would be particularly recommendable, she laughs at me and explains to me cheerfully that she often has difficulty in deciding herself. Most of the food on the menu is from farmyard production, local huntsmen and the surrounding forests. Finest herbs, wild sausage, homemade bread and tempting spreads. Oh well, then I will have a little taste of everything! The name of the friendly lady is Katharina Warter, she is the daughter of the house and since last year the new operator here at the farm together with her sister Theresa. To gain some insight, she offers to give me a guided tour through their realm right after lunch which I gladly accept. I can tell you already that there are many things to discover here. The guided tour, of which there are at least three per day during the summer, begins in the Latschenbrennerei distillery, next to the main house. The beautiful wooden hut was originally located in the valley and is also the place where everything began more than 15 years ago. Using water vapor, Bernhard Warter, the father of the two young ladies and his wife Doris began to extract oil from crushed needles and branches of the mountain pine. Oil with great effect, as I am about to learn during the course of the tour. Not only because it promotes blood circulation, but it also has substantial anti-inflammatory and analgesic capacity. It is also beneficial for muscles and joints and it has a mucolytic effect on the bronchi. Even today, the essential oil that is extracted here enjoys great popularity. I take another look around the cosy room, admire the over 100 years old leather pants hanging on the wall, smell and test the different products made of the mountain pine and learn many more interesting facts about our native plants and their effect. Actually it is quite astonishing what can be achieved with the power of nature. Slowly, we head back out in the open. Now we go to the heart of the Mandlberggut, the well-known Dachstein distillery, famous far beyond the borders of SalzburgerLand. 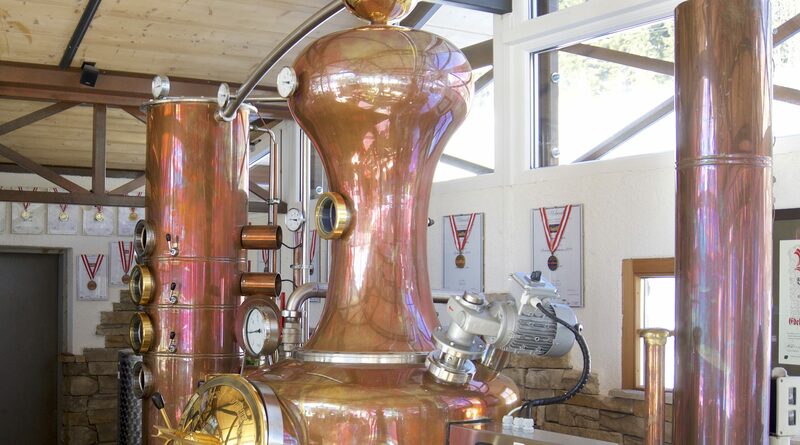 The distillery, with which Bernhard Warter fulfilled his lifelong dream, is really beautiful. Through the large panorama windows, the Dachstein mountain dominates here too. 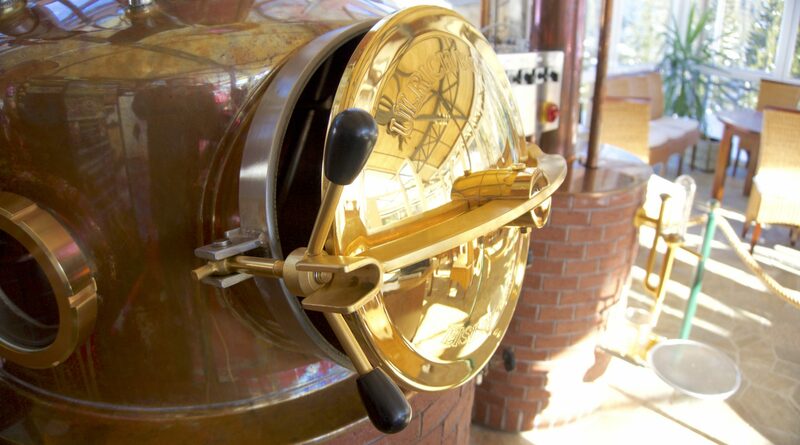 The flashy copper kettle shining in the sunlight and the large bar invites you to take a seat and taste one or the other noble spirit. 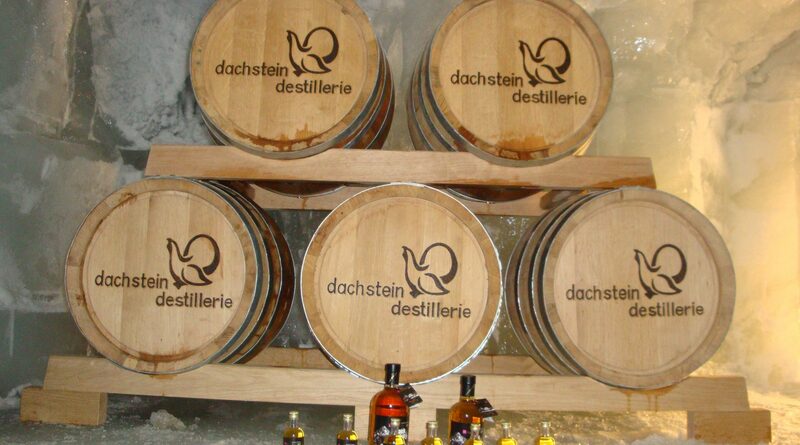 Even though the various types of schnapps in Salzburg’s first noble brandy are distilled here by his daughter Theresa, the Dachstein distillery is really famous for the excellent whiskey and the own gin. Strong as a rock and as majestic as the Dachstein mountain is how the Rock Whisky is supposed to be. And above all, a taste experience, where even long-standing whiskey drinkers break out in a hymn of praise and is commonly described as fruity-vanilla. The house owner himself who briefly joins us tells us that the secret is the excellent Dachstein mountain spring water from the in-house source. 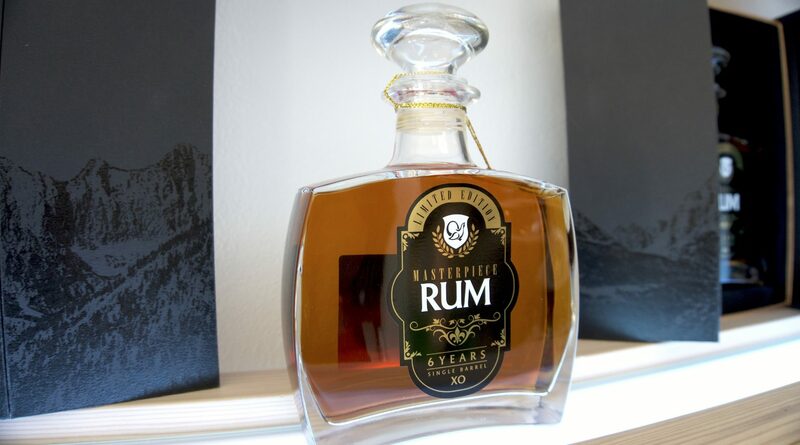 Without any need to filter it, this soft water is the perfect foundation to create great spirits. While I was still thinking about what I had just heard, and trying to imagine the path of each raindrop through the massive mountains in front of me, Katharina put a glass of water on the table and said, “Try! You will taste the difference.” Indeed! Rarely have I drunk better water than this. When I also tasted a bit from the whiskey, I also understand why this whiskey is so unique and outstanding. A great drink, not at all sharp and so varied in taste that almost every single taste bud gets excited. Some of the handmade oak barrels are currently stored at over 3,000 metres above sea level at the Eispalast in the eternal ice of the Dachstein glacier. If these survive the extremely inhospitable environment, then you can look forward to a very special whiskey in a few years. The gin is also very first-class, has only a delicate touch of the juniper berries and tastes quite different from what one usually imagines. And I mean this only in a positive way. 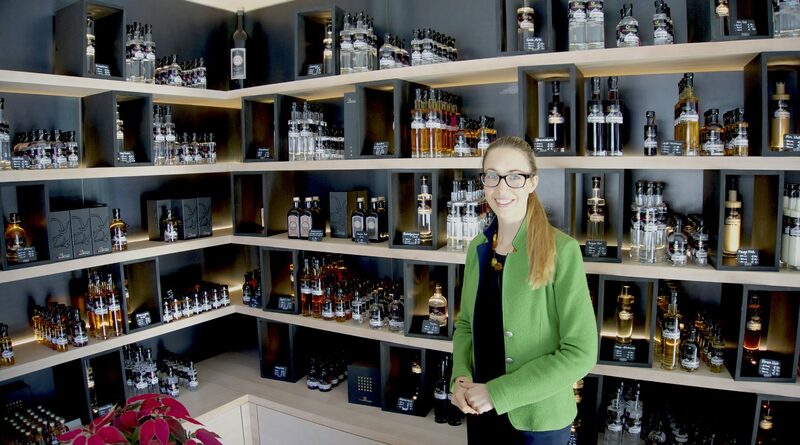 To my question where one can buy the products of the distilleries and the farm, Katharina also shows me the farm’s own store. Here you will find all the treasures passionately arranged waiting to be tasted and brought home. The selection is really huge and if you do not find anything for yourself here, you really cannot be helped. If you are not lucky enough to pay Mandlberggut a visit, you can order all those fine things at the Mandlberggut webshop. It has to be said that everything is of finest quality here. The family is living their dream and they gladly let their guests share the experience. No matter whether you stop here at the snack station, or you take a guided tour through the realm of the Warters, learn about the world of schnapps distilling at the Dachstein distillery, or even spend a few days’ vacation in one of the self-catering houses – every visit here will be a very special experience which will give you a lot of power and energy for your everyday life. Slowly but surely it is also time for me to say goodbye. After I have another bottle of gin wrapped, I wave for a last time and make my way back to Filzmoos. What a great day! If you would like to discover this gem in the mountains of the Salzburger Sportwelt, then do not hesitate and visit the Mandlberggut. You will be amazed at what you can discover here.